A significant segment of homeowners (21%) are dissatisfied with their choice of mortgage lender, according to a just-released J.D. Power survey. And the disappointment is even worse for first-time homebuyers (27%). The survey found that borrowers who start looking for a mortgage before they go house hunting and those who shop multiple mortgage lenders for their home loan tend to be more satisfied. It also named the most-favored and most-improved lenders for customer satisfaction. The J.D. Power survey used a 1,000-point scale, with anything below 600 representing a poor experience. Among the respondents, people who were dissatisfied faced the usual issues: an above-average number of problems or a lender that communicated poorly or didn’t keep a promise. However, even borrowers who compared multiple lenders to get more favorable fees and lower mortgage interest rates had regrets. Of those disappointed, nearly three-quarters (72%) said they felt pressured to choose a particular loan product. Homeowners who refinance their mortgage typically benefit from their previous experience. But the study found that satisfaction was appreciably higher among customers buying a home (840) than among those refinancing (821). In the past two years, the levels of satisfaction among both groups were nearly identical. Unsurprisingly, technology is playing a larger role in the mortgage process. More than one-quarter (28%) of respondents said they completed their application online. That’s up from 22% in 2015 and 18% in 2014. Quicken Loans was No. 1 in customer satisfaction — for the seventh year in a row — according to the survey, with a score of 869. The technology-leading lender performed particularly well in the application and approval processes. CitiMortgage moved from fifth position in 2015 to second this year, with a score of 851. Ditech Financial, a newcomer to the survey, ranked third. Wells Fargo Home Mortgage (+52 points) and Nationstar Mortgage (+50 points) garnered the most-improved scores in satisfaction levels from 2015. 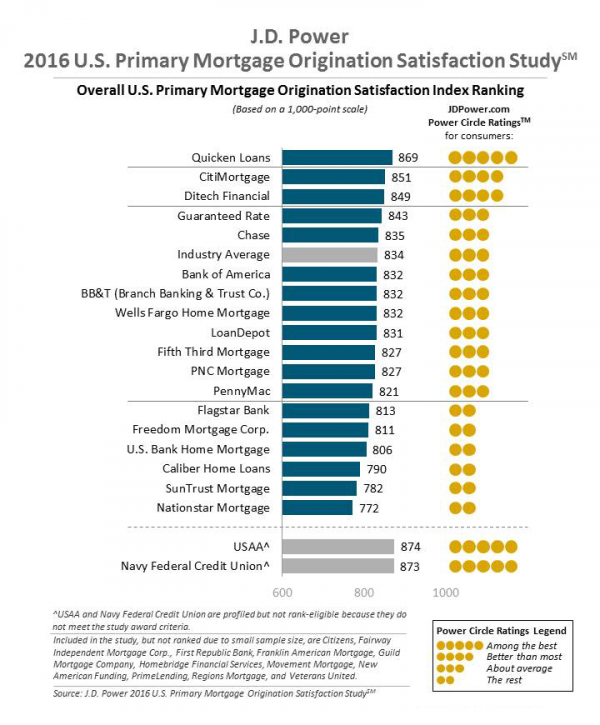 You can see the rankings of all of the lenders included in the survey below. Customers who explored their mortgage options before beginning their home search. Borrowers who got rate quotes from multiple lenders. The J.D. Power 2016 U.S. Primary Mortgage Origination Satisfaction Study, conducted in July and August, was based on responses from 5,182 people who originated a new mortgage or refinanced their home loans in the previous 12 months.